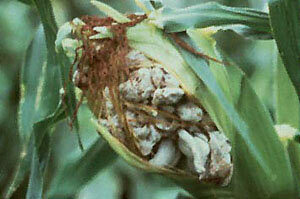 This fungus disease occurs on corn over most of the United States. It can infect any aboveground part of the plant, causing galls that are white and spongy when young, which later become gray-brown and filled with powdery black spores. Spores are spread by wind and splashing water. Hot, dry weather encourages the development of the disease, which is more common on younger plants. There are no chemical controls. Cut off the galls as soon as you notice them, before the masses of spores are released, and burn them. Clean up all plant debris in the garden at the end of the season. If you apply manure to your soil, use only well-composted manure. Grow resistant varieties.